The physicians at Raleigh Plastic Surgery Center specialize in Blepharoplasty, or Eyelid, Surgery in Raleigh, Cary and surrounding areas of North Carolina. 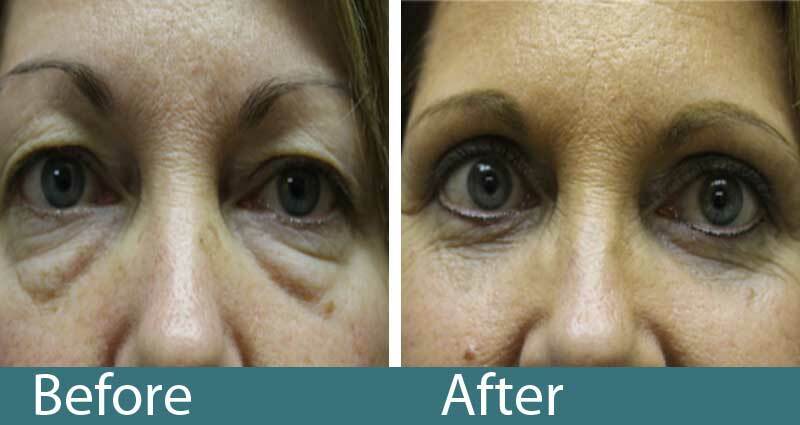 Eyelid rejuvenation involves surgical treatment of aging of the upper eyelids and/or the lower eyelids. This surgery is also known as a Blepharoplasty surgery. 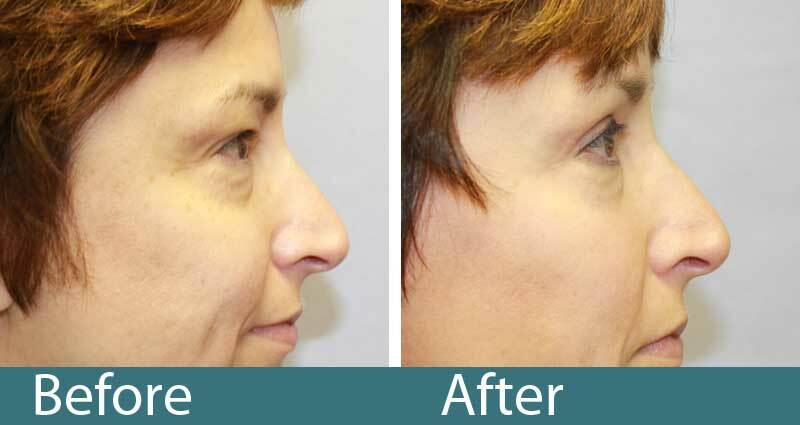 Upper eyelid surgery is somewhat more common and somewhat easier to recover from. The surgical procedures are designed to remove some of the excess skin and restore a more youthful appearing eye. The upper Blepharoplasty involves removal of excess skin of the upper eyelid and some degree of removal of bulging fat which is present under the muscle layer. This procedure is sometimes performed for visual changes and when the heavy excess upper eyelid skin inhibits the line of sight. Occasionally, this is a procedure covered by insurance with proper documentation. However, it is most frequently done for cosmetic reasons. 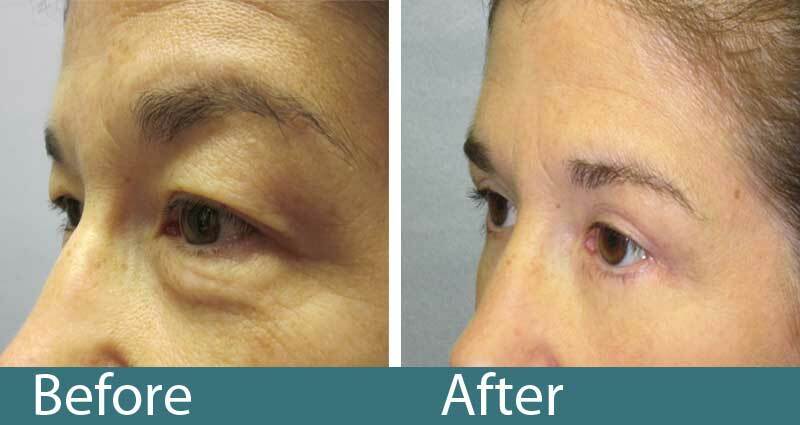 The lower Blepharoplasty improves bulging eye fat and the shape of the aging eye with some degree of wrinkle reduction, but, not as dramatic as the upper eyelid. In general, surgery to the lower eyelid has become less aggressive with time as potential complications are somewhat more frequent with lower eyelid surgery. New strategies to improve the appearance of aging lower eyelids are sometimes combined with face lifting techniques and may involve fat grafting or dermal fillers. 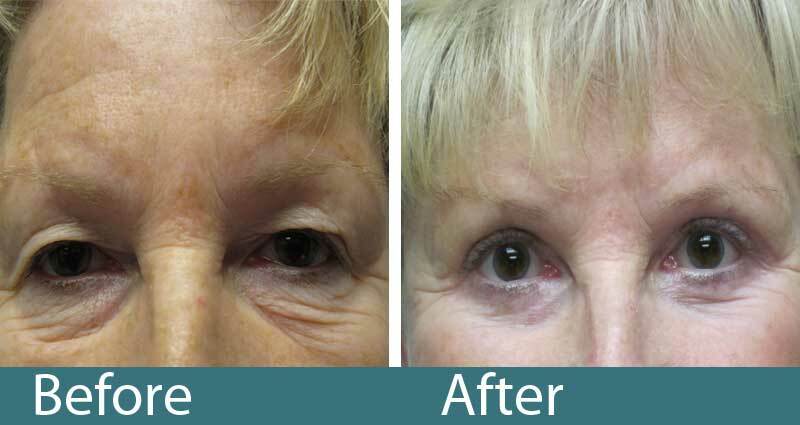 Upper and lower Blepharoplasty are frequently combined to achieve more comprehensive rejuvenation of the eye area. This is a 60 year old woman with hooding of her eyelids with skin excess who underwent an upper and lower blepharoplasty or “eyelift’. 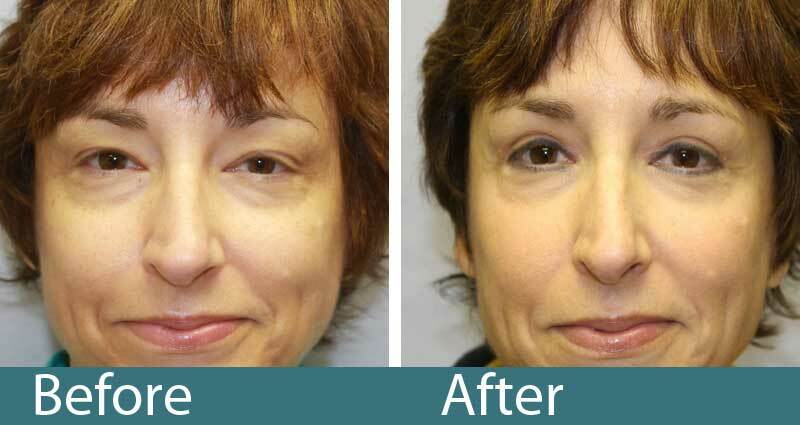 This 50 year old woman felt she looked tired and sought relieve with upper and lower blepharoplasty. 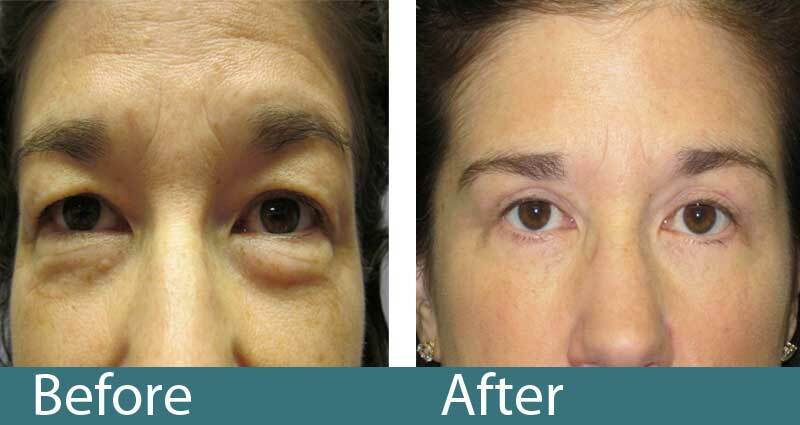 This 50 year old woman with heavy upper eyelids was pleased with he improvement with upper blepharoplasty. 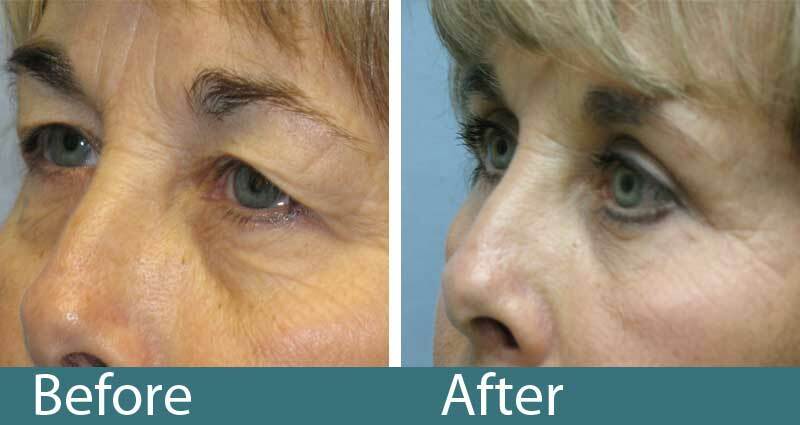 This 55 year old woman felt her eyelids looked like crepe-paper and was corrected with upper and lower blepharoplasty. 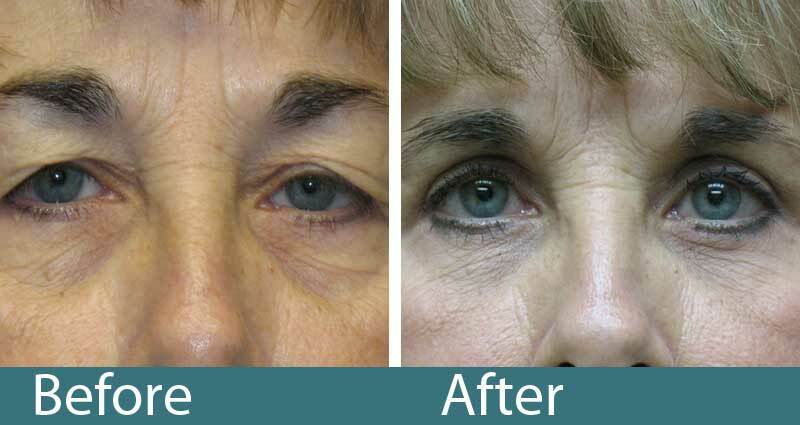 This 56 year old woman desired correction of bags under her eyelids. Result after upper and lower blepharoplasty. Eyelid surgery is frequently performed at our AAAHC approved surgical facility under the care of our board certified anesthesiologist either with a general anesthetic or an IV sedation technique. The procedure lasts approximately 1 to 1-1/2 hours and up to 2-1/2 hours if upper and lower eyelid procedures are combined. The surgeon meticulously removes excess skin and removes or repositions normal fat which has begun to protrude from a thin septum that is underneath the muscular layer. Fine suturing to close the wounds results in very minimal scar and improvement in appearance of the eyes. Specialized eye shields are utilized during surgery to protect the globe. Complications include visual changes, asymmetry, relaxation or drooping of the lower eyelid, which is usually temporary and notable only during lower eyelid surgery. Also, temporary inability to completely close the eye may occur transiently. Eyelid surgery is not terribly painful but is more uncomfortable because of limitation of eye movement in the first few days. Often the bandages are more of a nuisance than the actual discomfort from the surgery. Some degree of swelling and occasionally bruising can be expected and lasts anywhere from 7-10 days with some residual bruising potentially possible for up to 2 weeks. After the initial discomfort, recovery is rapid and most patients can return to normal day-to-day activities in 2 weeks. Strenuous exercise is avoided for 4 weeks and planning for social events should be delayed for 4 weeks as well. Q: Can I get insurance to pay for my blepharoplasty? A: Upper blepharoplasty is sometimes covered by insurance if you can demonstrate visual field deficit which usually is for peripheral vision caused by lateral hooding of the upper eyelids. Another option is to prove a limitation of upward gaze which is typically from excess upper eyelid skin. Visual field testing must be performed by an optometrist or ophthalmologist. Photographs and notation of these visual field deficits have to be provided to the insurance company before approval can be determined. Sometimes, brow ptosis or drooping is the culprit, but, most insurance companies will not pay for a formal brow lift. Q: How can I remove the skin lines under my eyes? A: Fine-line wrinkles around the eyes are not necessarily well treated with a lower blepharoplasty. 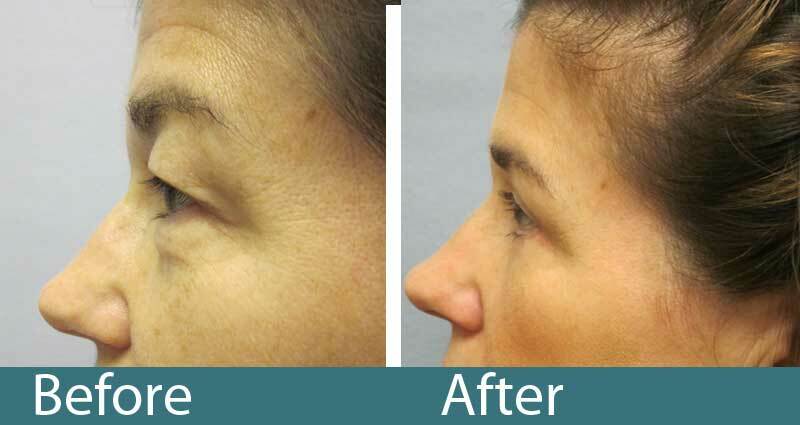 Lower blepharoplasty more accurately addresses excessive loose skin and fatty protrusion. 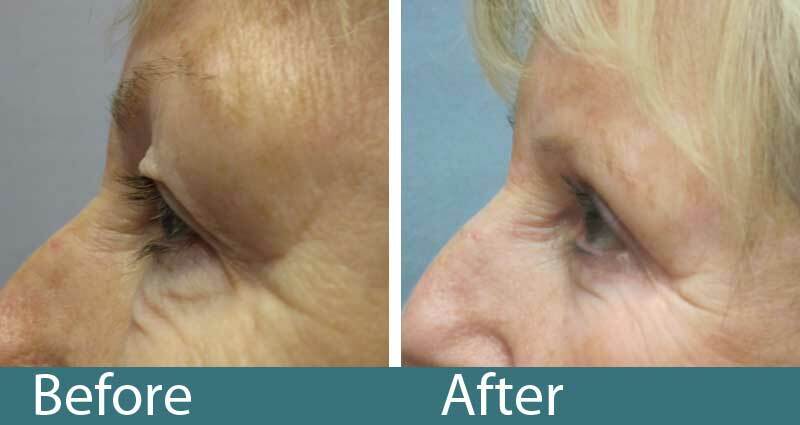 Improvement in lower eyelid skin may involve a combination of dermal fillers, appropriate skin care regimens, facial peels, laser treatments and noninvasive skin tightening such as Thermage. 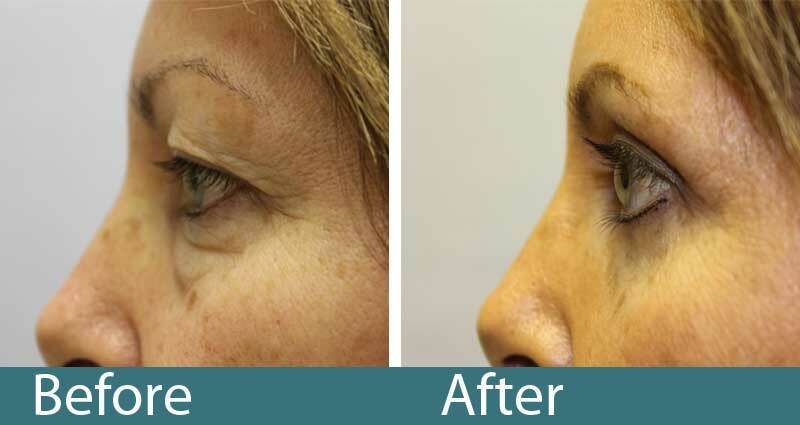 Although lower blepharoplasty does help smooth the lower eyelid, excessive tightening to attempt to completely remove these wrinkles can lead to eyelid shape changes that can be quite distressing.